This is to help you have some idea of what is available and what is on back order or worse. Please use this as a guide. If you have a question about a particular item or the status of one of these items previously ordered, please give us a call at 918-696-5998. Both AlpineAire and Ready Reserve Foods are shipping food system orders in two week are less. Individual can orders may take a little longer. 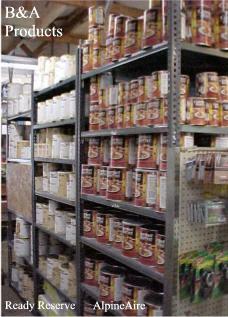 We even have some items in stock in our warehouse. Ready Reserve seeds, samplers, sprouting kits and candles are in B&A's stock. AlpineAire 3-Day Food Packs are in stock at B&A. The BayGen original FRP1 radio has been replaced by the NEW GLOBAL Shortwave Radio. It even includes a built-in solar panel and we are selling them at the same price as the old 4011 radios. Our new stock number is 4011A. We do NOT have these in stock. (Date: June 10, 2001). We do have the AM/FM BayGen Jrs (FPR2) at a close-out price. We also have the 4012S with solar panel in a clear blue case. (Date: Nov 30, 2000). The SM837D Info-Mate radios (AM/FM/SW/VHF/TV) is currently in stock. (Date: Dec 29, 1999).